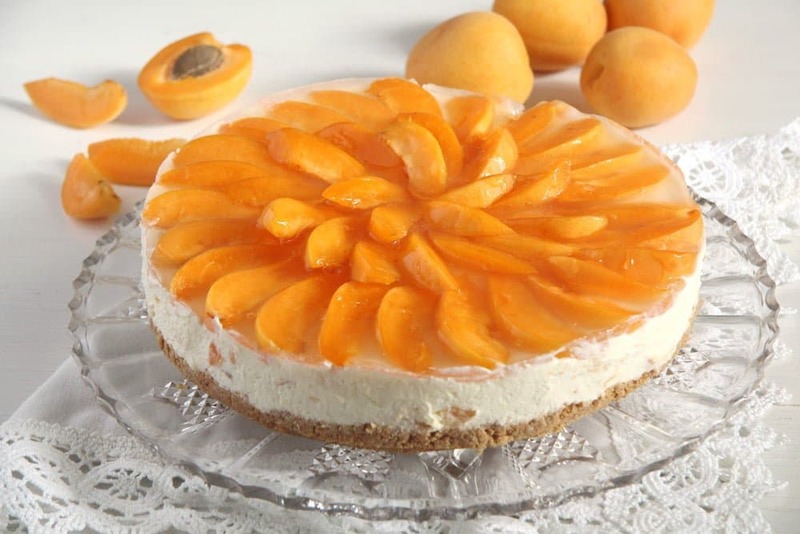 Delightfully sweet and creamy cheesecake made with white chocolate and topped with fresh apricots. I hope you are not bored with me only posting cheesecakes this week! Well, if you like them as much as I do, you wouldn’t, there are so many ways of making a cheesecake, it can never get boring, in my opinion. This recipe is another one of our favorites. Originally made with strawberries, I decided to give it a twist this time and try it with some nice, ripe apricots. They are in season now and I can’t resist buying some every time I see them. I love them fresh, but not only, apricot jam is one of the best jams ever, if you ask me. 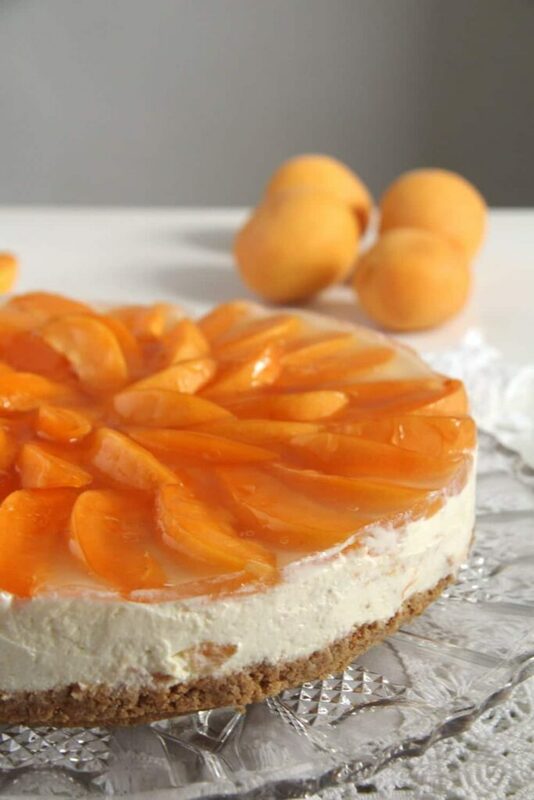 If you want to make this cake while apricots are out of season, you could definitely used canned apricots, fresh are nicer, but canned would do as well. Peaches are also a good alternative, either fresh or canned and like I mentioned before: strawberries. I used a mixture of plain butter biscuits and amaretti biscuits for a bit of flavor, but you could use either only one sort of them or completely other cookies, like oatmeal cookies, digestives or whatever else you use when making a cheesecake. I am not very particular when it comes to making the base, whatever you have or whatever suits your fancy at the moment. Regarding the white chocolate, I follow the same rule as in the case of regular chocolate. For best results, use the best quality chocolate you can afford, it really makes a difference in the taste. 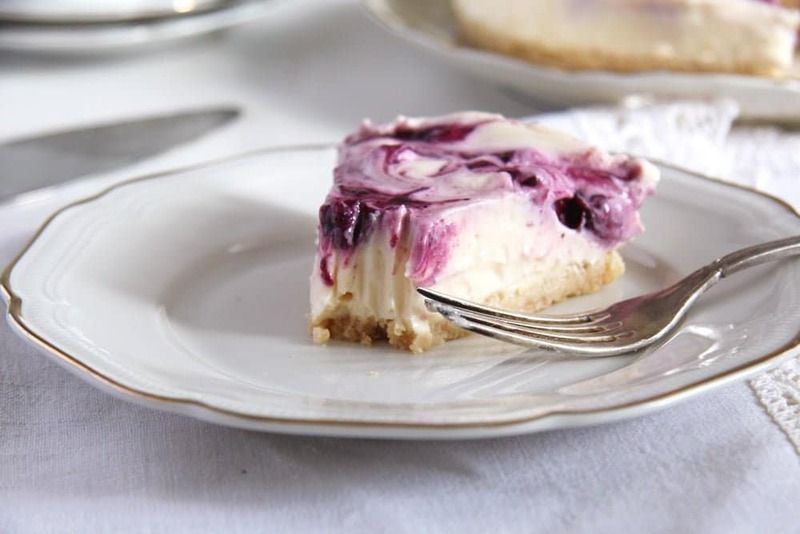 The white chocolate plays a key role in this cheesecake, so if the chocolate is not what you would normally like to eat, then you will not be crazy about the cheesecake either. After melting the chocolate, allow it to cool down for up to 10 minutes before mixing it with the whipped cream. I was not patient enough on one occasion and there were tiny lumps of chocolate forming in my cream. So, do give the chocolate its 10 minutes. 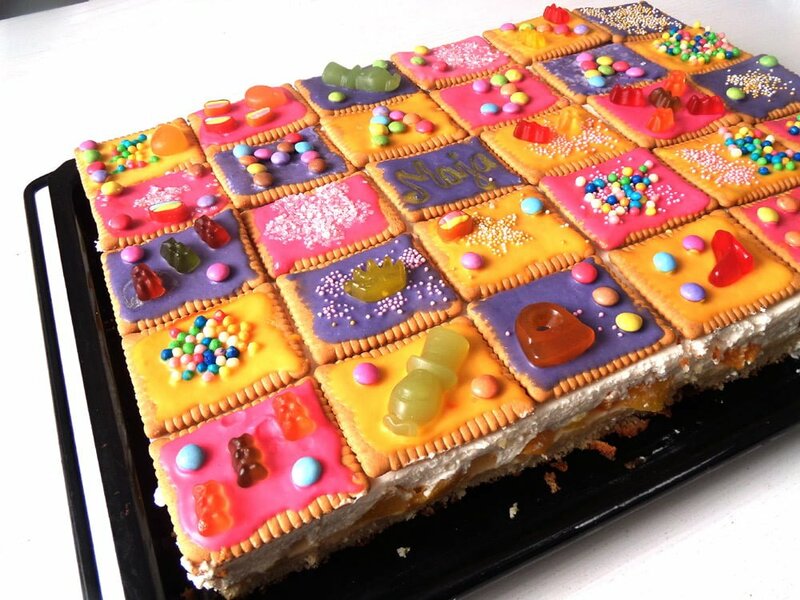 That would be the “greatest” difficulty when making this cake, otherwise you will be done in no time. An express cake, just like the blueberry cheesecake from Monday. About the glaze on top. 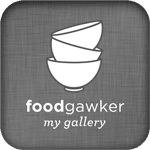 I use the very common Tortenguss – fruit tart glaze. It is a small sachet of powder, which I mix with 2 tablespoons sugar and 250 ml/ ½ water and bring to a boil while stirring continuously. This mixture will be poured over the fruit and it will jellify. I am not sure how available that is outside Europe, I have searched for some recipes, but didn’t really find anything. If that is unavailable in your area, you can glaze the apricots, by heating up a bit of jam (apricots or peach or something light in color in this case) and brush this jam over the apricots. It might not be as stable as the jelly glaze but it will do. And to see the positive in this case: jam tastes better than jelly. Process the biscuits and the amaretti in a food processor. Add the melted butter and combine well. Press this mixture onto the bottom of a buttered 18 cm/ 7 inch springform. Place in the fridge until you are finished with making the filling. Chop the white chocolate very finely. Place it in a small metal bowl, place this bowl on top of a pan filled with water. Make sure the water doesn't touch the bottom of the bowl. Heat the water, but do not let it come to a boil. Melt the chocolate while stirring often. Set aside and let stand for up to 10 minutes. In the meantime whip the double cream. Finely chop 2 or 3 of the apricots. Add 3-4 tablespoons of the whipped cream to the chocolate and stir well. On low speed beat the white chocolate into the whipped cream. Continue beating until soft peaks are formed. 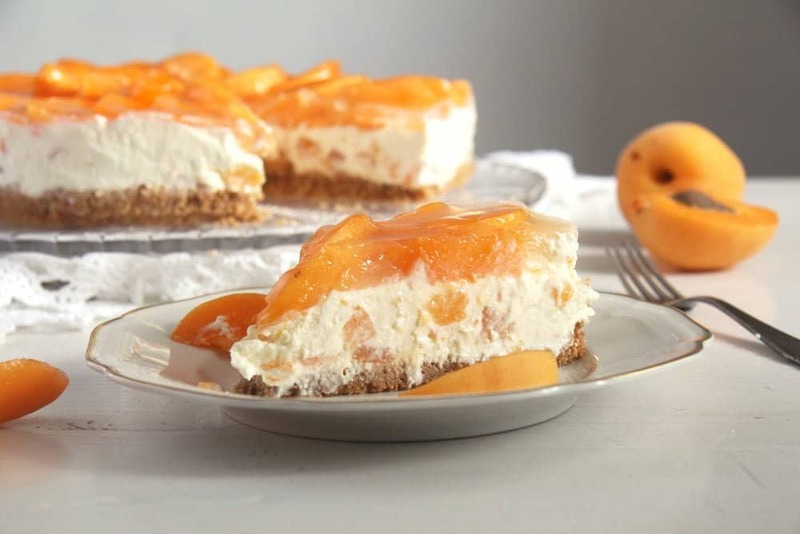 Fold in the chopped apricots and distribute this mixture onto the base of the cheesecake. Level. Slice the rest of the apricots (or as many as necessary) and arrange them on top of the cake. Prepare the cake glaze according to the packet’s instructions. That is place the powder in a small pan and mix it with 2 tablespoons sugar. Slowly add the water while stirring all the time. Bring to a boil while stirring continuously. Turn off the heat, let the mixture cool for 1 minute and pour over the fruit starting in the middle. You will not need all the glaze for this cake, only about half of it or so. Alternatively glaze the fruit with a few tablespoons heated jam. Oh I love cheesecakes and definitely can’t get sick of them! 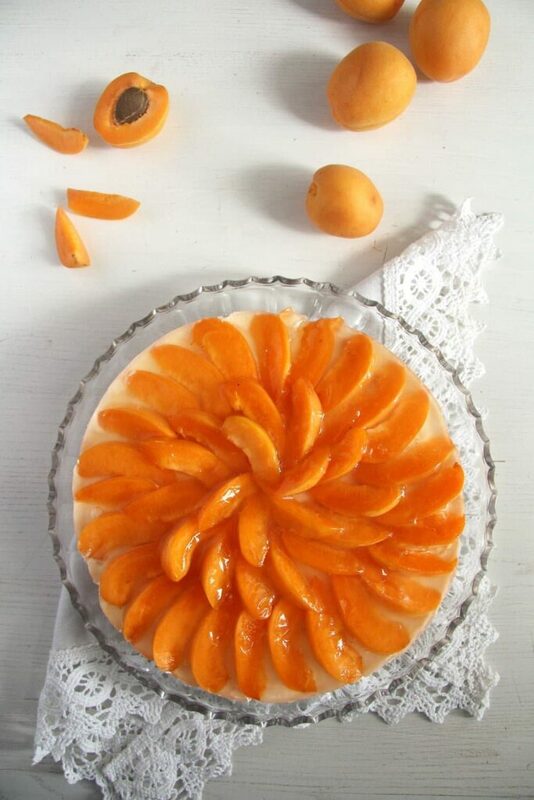 I love all the beautiful apricots on this cheesecake – they would pair so beautifully with the white chocolate. Yum! You can’t have too many cheesecakes! I love that you’ve used fresh apricots! I bought a huge box of apricots that I need to finish off. Now I’ve got another way to use them! and this one’s even better than the previous two! i’m a sucker for white chocolate and also love the unique sweetness of apricots! EEEE! White chocolate is my FAVORITE!! And I adore a good cheesecake! And this one looks fabulous! White chocolate and apricot!? YES please! Cheers! My husband loves white chocolate! 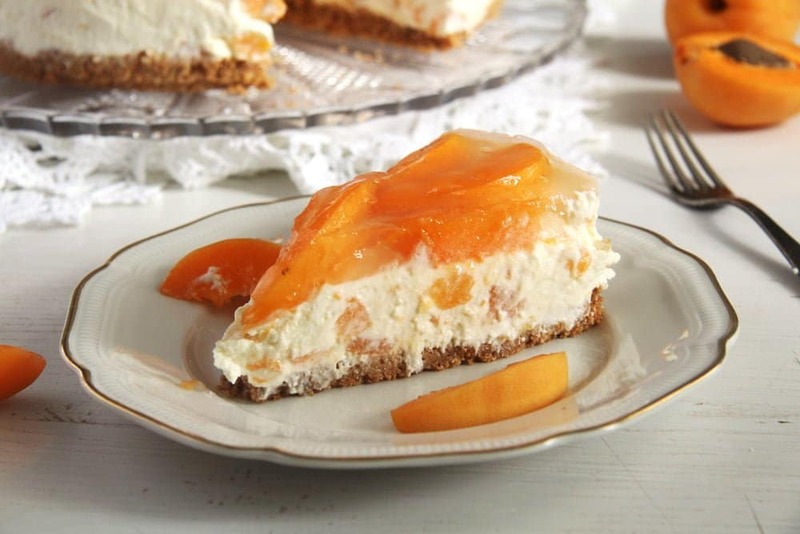 This one looks so beautiful and light with sweet apricots. 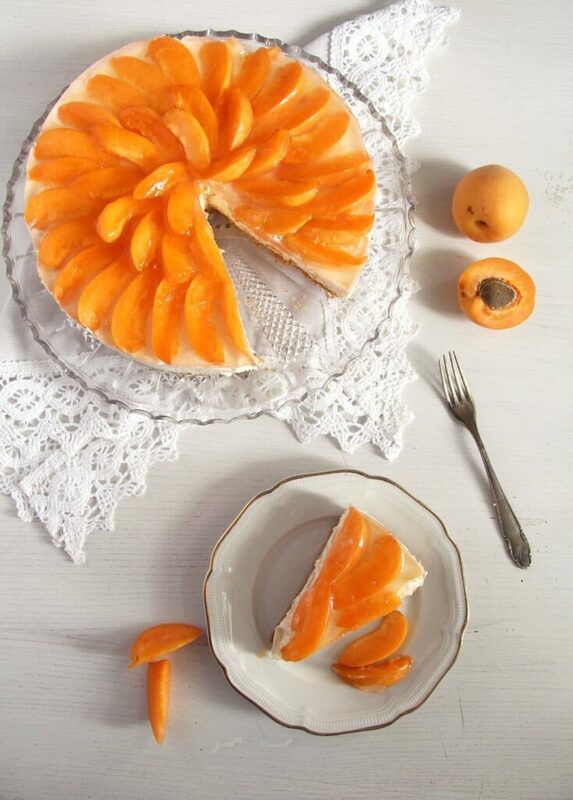 Very creative to use ripe apricots and the cake turned out beautifully. Your family is lucky to have these cheesecakes turn out in your kitchen! I would never get bored with cheesecakes and this one sounds fantastic as all those you have posted. I haven’t made any sweets with apricots this year yet. Time to think of them! Could never get bored of looking at all of these gorgeous cheesecakes! It’s like having a lovely bakery case on my computer screen 🙂 I’m smitten with how much apricot is in this recipe – chunks in the cake and the pretty slices on top, you are sooo right apricot jam is the best jam ever! What a gorgeous cheesecake!!! You ARE a perfectionist! The heavy cream and white chocolate mixture is like some kind of cheesecake, there is no other cheese involved.